Some of my recent work as a digital strategist involves examining why things are not happening in the media sector. Everything should be in place. And yet companies still fail. And for that I look to all the lessons learned from the past. That's why I have been trawling through the Media Network archives to listen again to what issues the media were struggling with 10, 20 even 30 years ago. But frankly I learn the most by looking at other industries often far removed from media. Last week a colleague in the Startup industry pointed me back in the direction of Harvard Professor Clayton Christensen. I have seen Clayton before on various US talk shows when he appeared to promote one of his many books dealing with disruptive innovation. But most of those videos are short and don't go into much detail. There's an example below in which he looks at innovation in chemistry (Dupont). Who is Clayton Christensen and why should you care? 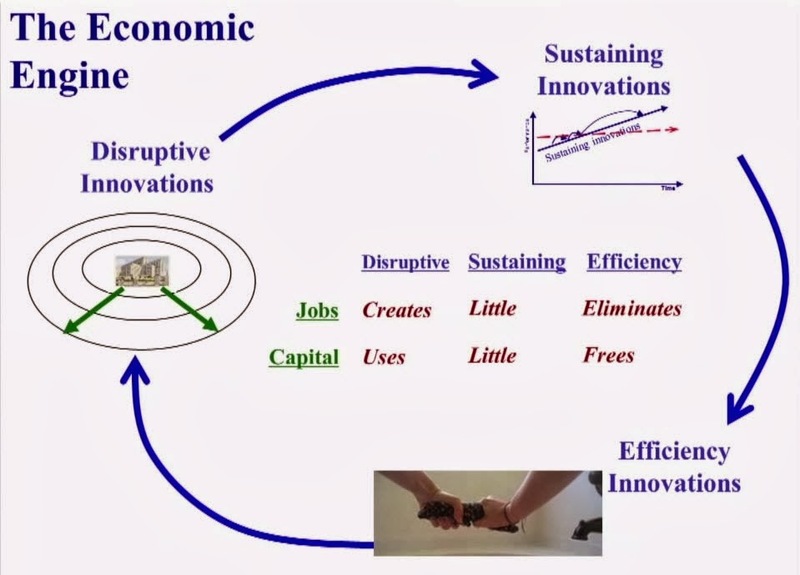 There's another short video in which he explains the Innovator's dilemma. To save you time, I've summarized the points after the video. The innovators dilemma is simple. As a company moves forward, should they be gradually improving their products so they can sell these at higher prices to their best customers? Or should they be making lower-cost lower-margin products and go after new markets which are unknown? Christiansen shows that when it comes to gradual sustained innovation (some people call this waterfall development) then the incumbents usually win. 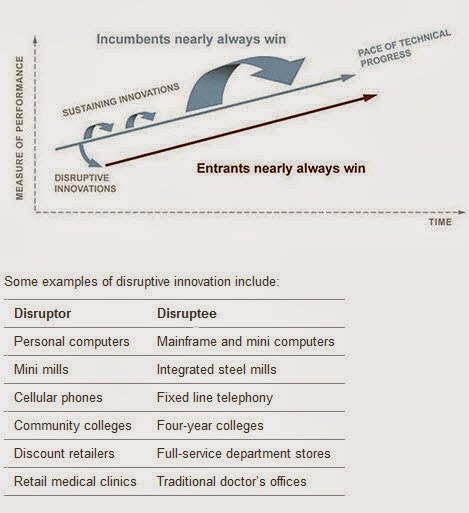 But when it comes to disruptive innovation, the new guys are usually successful. But wait, there is a lot more. He gave three hour-long lectures at Oxford University in June 2013 which are somewhat buried on YouTube. That's a shame because his analysis of why companies, economies and countries are stagnating is ringing loud bells in my ears. If you only watch one of the videos in this post, then watch this one. I've done my best to summarize the essence of his arguments below the video. His talk starts by tracing the decline and eventual disappearance of huge integrated steel mills. These 10 billion dollar plants once made all the steel grades. Until, that is, the mini-mills came along. They make steel from scrap metal by melting it in small electric furnaces. What's more, you can now make steel of any quality for 20% lower cost in a mini-mill rather than an integrated mill. So it seems strange that not a single owner of an integrated mill has been able to deploy a mini-mill. 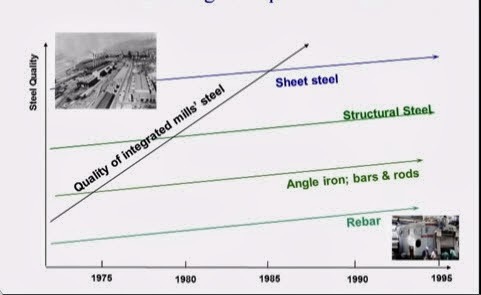 What happened was that integrated steel mills gave the lower markets away to mini-mills, and started to focus on the next tier of quality where profits were higher. That was fine until the mini-mills found a way to make that particular tier more cheaply. There comes a point of course when the mini-mills can make all kinds of steel and the integrated mills have no customers left. When you're at the top, there is no place to go. It is a similar story with how Toyota gave General Motors a hiding in the US by coming in at the bottom of the market at disrupting the way they made cars. It is also true that the Koreans and Chinese manufacturers are now starting to do the same thing to Toyota. Clayton then goes on to explain that there are really three types of innovation. Disruptive innovation is done by companies that transform complicated products into simple products, thus making it accessible to a much broader market. He takes the example of Asus who brought laptop's down to a price that most people went for a portable machine rather than the classic PC tower. He points out that disruptive companies create jobs, and make use of capital investment over a 3-5 year time frame. He then moves on to consider those Sustaining innovations. These companies make good products better, by refining things incrementally. They tend to make little use of capital investment. What's more these companies don't create many jobs. Finally, you have the Efficiency Innovations. He cites Walmart type stores as an example. Here the focus is on purely on driving down the cost. That usually ends up in eliminating jobs as well as freeing up a lot of the investment capital. And the world is now awash with capital. Things are fine as long as the capital freed from efficiency innovation is used to invest in disruptive innovations. But that's exactly what's gone wrong in the last 20 years. In our risk averse world (especially Western Europe) the business colleges have been teaching about efficiency innovations, but doing little to explain that it is not the same as disruptive. 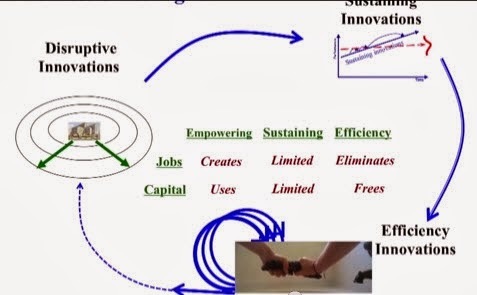 Clayton points out is that many efficiency innovators have decided to make even more efficiency innovations which pay dividends in a couple of years, freeing up even more capital. In the last 20 years, the number of disruptive innovations created by the US economy is 1/3 compared to the situation in the 1960's, 70's and 80's. So the model now looks like the one below. And the result is a wash of capital and very few new jobs. The cost of capital is zero! (He explains that in the latest funding round for Square, investors paid Square to take their money!). If you want to see what is happening to the US and the economies of Western Europe (especially countries like The Netherlands and the UK), you only have to look at what happened in Japan. He points to Japan as the innovation lesson which others need to avoid. Japan was known for brilliant developments in the 1950's, 60's and 70's the home of all the technology innovation. They made motorcycles affordable. Sony made portable cassette machines and TV's so that everyone could afford it. Canon and Epson made printers accessible to millions. "Made in Japan" really meant something of value. Clayton suggests that the only technology we've heard of in the 1990's from Japan is the Nintendo Wii. In general I tend to agree (Canon and Nikon are exceptions ). But disruptive innovation from consumer electronics brands like Sony, Sharp, Panasonic and Toshiba are just distant memories. That's confirmed if you walk around today's International CES show in Las Vegas. When Japan stopped investing in disruption, Singapore, Taiwan and Korea took their place. China is now at a rate of massive growth, so the question is whether India is really coming next. Do they have the capacity to innovate disruptively? And ae some of the new smart hubs springing up in Europe capable of getting the necessary investment to truly disrupt - and create jobs? The conclusion is that capital is overly abundant. Its cost is zero. What is scarce are the investments in people to help them become more capable people. How long will it take governments to realise this? And why haven't we seen the same kind of disruption coming from Africa and Latin America. I would argue because not enough disruptive technology is made in Africa. At least, not yet. I'm applying these same thoughts to looking at the current media industry in Western Europe. Do you also see the parallels? Who wants to do something about it? (UPDATE: Had over a hundred private emails as a result of this post. Apparently, you do see the same path forward). Update Jan 23rd 2014. This report from Davos confirms that jobs and investment are the only way out of the crisis. And we know now that means investment in disruptive ideas and companies.